This week’s Highlands real estate spotlight is on a charming cottage located at 164 Wyanoak Drive. The cottage offers a perfect mountain getaway, oozing with charm in an idyllic setting with great mountain views. 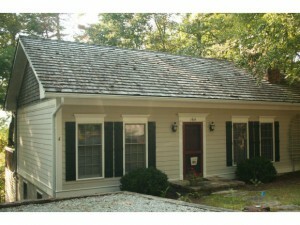 If you have been looking for a mountain getaway in Highlands NC, 164 Wyanoak Drive is a must-see. This lovely, charming cottage has a painted plank vaulted ceiling and fireplace in the living room, wood floors, a large modern kitchen, laurel handrails, a main floor master with vaulted ceiling and a sitting area and so much more. There is also a lower level family room complete with a wood stove and a game area. There are an additional two guest suits and a full bath. This stunning Highlands home is available furnished. Contact me, Lynn Kimball, today to schedule a private showing of 164 Wyanoak Drive or any other Highlands property currently listed for sale. I welcome the opportunity to serve as your guide to real estate in Highlands NC. Let me hop you complete a successful real estate search and locate a property that suits your needs and your lifestyle.